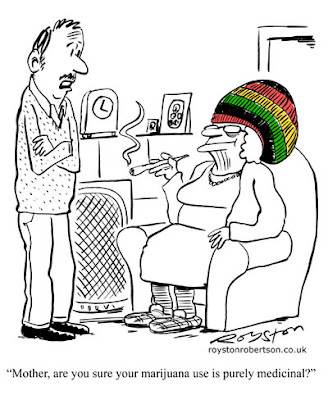 This cartoon, which appears in the July issue of Reader's Digest, was the result of a deliberate attempt at getting more mileage out of a well-worn cartoon theme! I've had a few HMV dog cartoons published over the years, so I decided to see if I could come up with some more. I opened one of them on my computer in Photoshop and played about with the elements of the drawing – the dog and the gramophone – moving and rotating them, resizing them, copying and pasting etc. 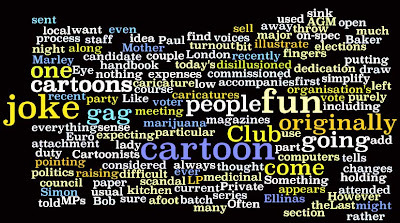 It's an unusual way of developing gag ideas, for me anyway, but I came up with a few. Once I was happy with each one, I printed off the cobbled-together image and redrew it on my lightbox, so it looked more fluid. 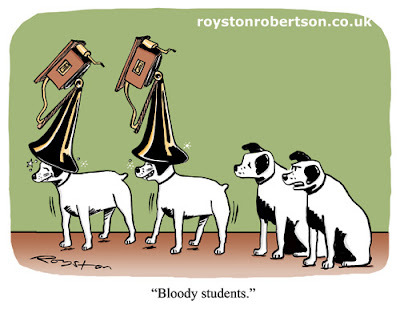 This is the only one that has been published so far, but you may yet see more HMV dog cartoons from me. 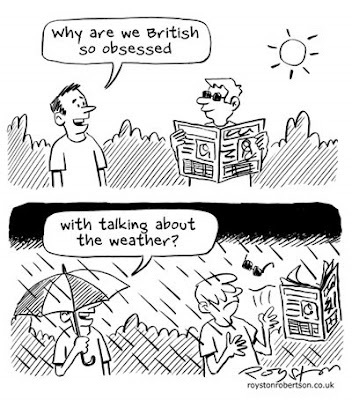 This cartoon has been redacted but we can assure you that it was very, very funny. We were all faced with an unfamiliar word last week: redaction, the editing out of certain "sensitive" details from the newly released MPs' expenses claims. 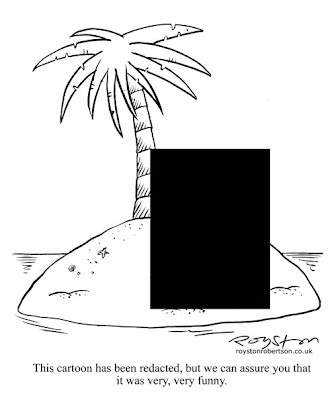 The distinctive black rectangle was a striking visual image and, of course, a gift for cartoonists. You can see a round-up of redacted cartoons at the Bloghorn. This one of mine didn't sell, but I didn't feel too bad about that because all I did was take an old desert-island cartoon and put a black rectangle on it in Photoshop! 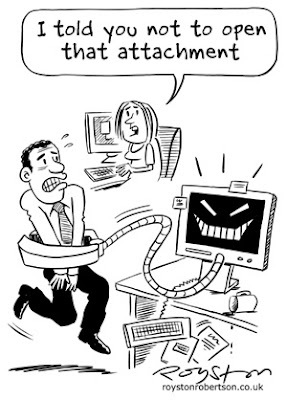 "I told you not to open that attachment." 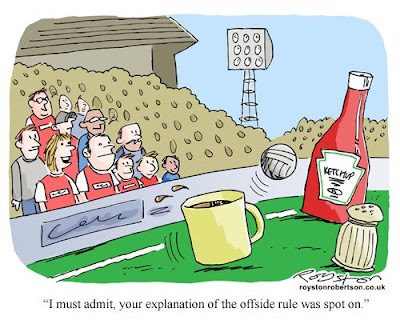 I was recently commissioned to draw a series of cartoons to illustrate an organisation's staff handbook. Here's one of them, it accompanies the section on computers. 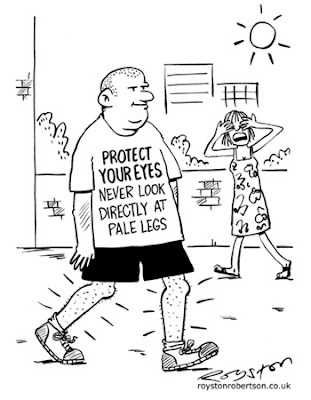 The joke here was originally used in a gag cartoon which I sent out as part of an on-spec batch to all the usual magazines. It did not sell, but I always thought it was a fun joke, so I was glad to give it an airing (and get paid for it, of course) in a different context. Rejected cartoons, or the jokes within them, will often get used somewhere other than the newsstand magazines, so the time spent on them is rarely wasted. 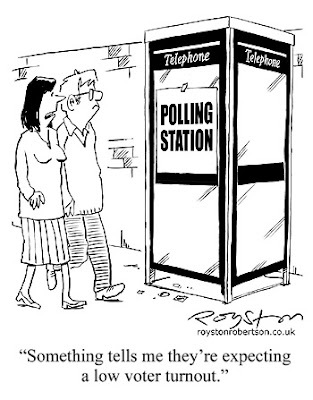 Here's a local paper cartoon on today's Euro and council elections. Like many people who are more than a bit disillusioned with politics, I'll be going along to vote out of a sense of duty to the process itself, rather than dedication to any particular candidate or party. This is nothing to do with the recent MPs' expenses scandal, by the way, I was disillusioned way before that! I do know I won't be transferring my vote to the British National Party, and I find it bizarre that anyone would vote in such a way to "punish" the main parties over expenses. Maybe I should spoil my ballot paper by drawing a cartoon on it. It might at least cheer up one of the people who have the thankless task of counting all the votes. 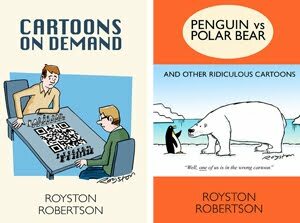 Last night I attended the AGM of the Cartoonists' Club in London. It was not the most fun meeting ever, as major changes are afoot at the club, so there was much raising of voices and pointing of fingers. (Not from me I might add!) 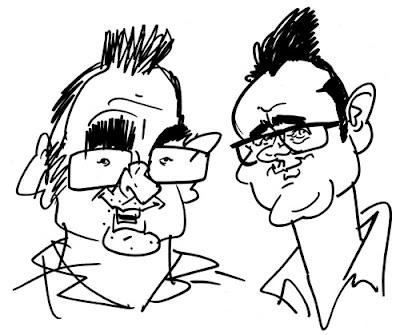 However, I did come away with a couple of fun caricatures by Simon Ellinas, left, and Paul Baker. I am of course, not the most difficult of people to caricature. Once you've got the qiuff, the glasses and the eyebows you've more or less captured me. Well, me or Morrissey.